A gold mine! 28 lively Scandinavian dance tunes are arranged and played in a classical/folk style that is as great for listening to as it is for dancing. Even better for dancers, this is also a CD ROM. Pop it in your computer and you have the dance instructions and background notes for all the dances. Permission is granted for use of this CD, the music and instructions, for Scandinavian dance performances. 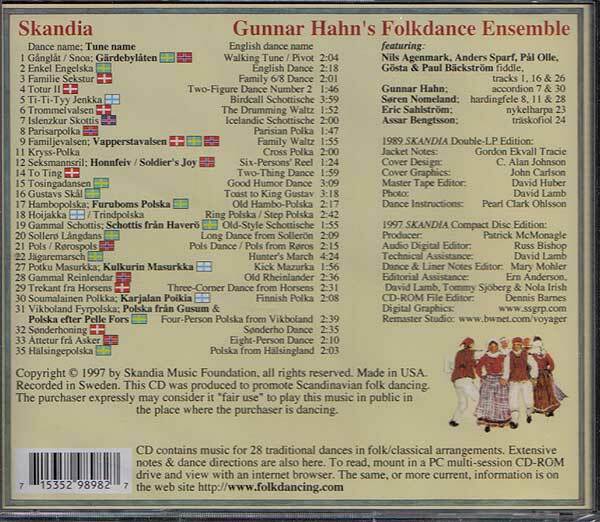 Gunnar Hahn's Folkdance Ensemble, Skandia Folkdance Society. CD. See the back of the CD jacket and the list of songs on this CD.